Lock in a great price for Lotus Bleu Resort & Restaurant – rated 9.3 by recent guests! Everyone here is so friendly and nice and really eager to help. They really do go out of their way to make you stay as comfortable as possible. It was a little hard to find at first. The taxi driver had to ask some locals but it wasn't that big a problem. All in all...an amazing hotel. It's very well kept, and the staff has lots of respect for your privacy. You will be amongst fantastic people who will make your stay brilliant and memorable. Accueil chaleureux et familiale, le personnel est à vos soins. L'hôtel est très bien situé dans le village et vous disposez de tout le nécessaire à l'hôtel ou à proximité, restauration, piscine, location scooter ou voiture, massage, linge... Un besoin ou une envie et la direction vous trouvera une solution c'est du vrai service clientèle. Tout etait parfait dans une ambiance conviviale et festive . Merci à Nicolas ,sa compagne et toute leur équipe. A recommander sans modération. Super freundliches Personal und die Küche wahr auch sehr gut. Wir kommen gerne wieder!!! Located in Rawai Beach, Lotus Bleu Resort & Restaurant provides a garden. Featuring a 24-hour front desk, this property also welcomes guests with a restaurant and an outdoor pool. The tour desk is available to assist guests in planning their days out. All guest rooms in the resort are equipped with a flat-screen TV with satellite channels. The rooms are equipped with a seating area. Lotus Bleu Resort & Restaurant has a terrace. Nai Harn Beach is 2.8 miles from the accommodation. 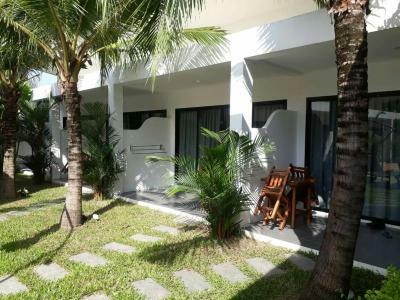 The nearest airport is Phuket Airport, 28 miles from Lotus Bleu Resort & Restaurant. When would you like to stay at Lotus Bleu Resort & Restaurant? This double room has a tea/coffee maker, microwave and seating area. House Rules Lotus Bleu Resort & Restaurant takes special requests – add in the next step! Lotus Bleu Resort &amp; Restaurant accepts these cards and reserves the right to temporarily hold an amount prior to arrival. Lotus Bleu Resort & Restaurant accepts these cards and reserves the right to temporarily hold an amount prior to arrival.